It is a Nice and well located hotel! The breakfast included is very good. I really enjoyed my daily dose of capuchino! Pastries were fantastic. I really liked the decoration. It made me feel like home. Thank you very much for having shared your comments about the recent stay at the Hotel Indigo Rome St. George. I am very proud to know you loved our hotel and our friendly and helpful staff and I am pleased to hear your appreciation about our very convenient central location to explore the City. I am thrilled to learn that we are always able to leave a positive impression, the team will be delighted. We all look forward to having another opportunity to welcome you back to the hotel in the near future. We love staying in St George creators and artist neighborhood and live Indigo in Rome. Balcony overlooking ancient terra cotta tiled old roofs and hearing church bells combined creates Rome in your room. The care of the tuck down w chocolates in evening and always keep the facility clean and pleasant is fabulous treatment. Staff was excellent in meeting every request with energy and smile. A great spot to stay when in Rome. Thank you so much for taking the time in sharing your amazing feedback! Always great to see that our hotel has a positive effect on our guest experience. I am also delighted to see that our staff contributed in making it a great experience. I will be sure to share your review with the entire team! I could not agree with you more that we are situated in the perfect location with easy access to many Rome attractions and landmarks. Stayed here 3 nights to start off our Italy vacation. It was a perfect location central to all the main attractions we wanted to see. Easy walking distance to restaurants, shopping and so many things to see. Staff was friendly and helpful every time they were needed. Really enjoyed the sauna and Roman Bath, I only wish it was open later. We would have loved to use it after dinner in the evenings but it was already closed before then. As others have mentioned, it was hard to get the room temperature to the right comfort level, which we understood going in due to the constraints of working with an old building. Thankfully, the weather was comfortable during our visit so we were able to open the window when the room got too warm. Platinum status got us a room upgrade, which included a stocked minibar replenished daily. Definitely an awesome perk along with the complementary smartphone provided in the room for use around town. Overall, it was a great stay and we would definitely stay here again if we were back in Rome. Thank you so very much for your wonderful review, I am delighted to know that you truly enjoyed your stay at the Hotel Indigo Rome - St. George. I was very happy to learn that the overall impression of the location, rooms and spa was very good. I am particularly proud to know that you found our staff very nice and attentive. Thank you for having mentioned our useful Handy, a completely free smartphone you can enjoy during your stay inside and outside the hotel. Once again thank you very much for your time and for choosing to stay at the Hotel Indigo Rome - St. George and we hope to see you very soon here in Rome. Couldnâ€™t spend 2 days better in Rome. Currently sleeping in room 408... and really impressed and satisfied. A warm welcome by Roberto from Front desk.... professional fast check in with a few good hints including benefits and places to visit. Then you go to the bar and the I sofa restaurant and guess what...... you meat a great team, including the kitchen brigade who prepares mouth watering dishes to compliment your nice stay in Rome. No Valerio and team no party :) a great host for I sofa restaurant that knows how to make your experience a memorable one... making you want to come over again. Rooms clean, good size and comfortable. 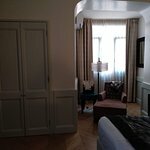 A great hotel in the middle of Rome with all locations walking distance. Thank you for taking the time to share your experience at the Hotel Indigo Rome - St. George. Lovely boutique hotel with a very good location.We've been there last month and we really enjoyed our stay.From the moment we steped inside everything was amazing. As we requested and early check in our room was ready when we arrived, at noon, very appreciated. We had a superior queen on the third floor, very spacious,cozy and also very quite.Best regards for the ladies from the HSK as the room was very clean and everything needed was inside(from the sewing kit to sleepers). For sure we will recommend. Thank you for your very positive feedback following your recent stay with us. I'm delighted to hear that we met your expectations and that you enjoyed our excellent hotel, with helpful and professional staff. It is our goal to consistently provide customer satisfaction and your comments are very important to us. The feedback we receive from valued guests like yourself, enables us to keep up the good work. We hope to have the opportunity to welcome you back to the Hotel Indigo Rome - St. George your next visit to Rome!